Welcome back to GenreQuest, the weekly GR feature that talks about pretty much every 3D platformer in existence and how good (or bad) they are. 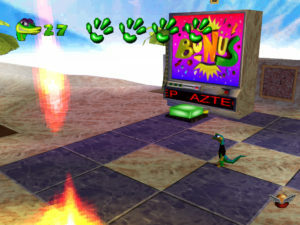 This week we’ve got something of a treat with a couple of entries from the Gex series, something that cult classics fans might know a thing or two about, and then a game about a moving glove… just one week without something weird would be nice. Let’s begin. Technically, this game is supposed to be the second one on this week’s list, but since this is the 2nd game in the series and the other is the 3rd, I thought we’d just go with it. 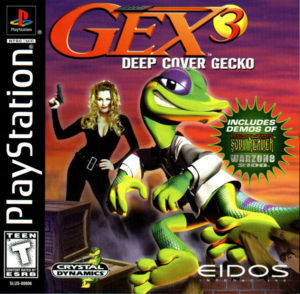 For those of you who don’t know, Gex is a PlayStation era platformer series that has its roots in classic 2D platformer territory. What I mean when I say that is that the first game was a 2D platfomer and all subsequent games were 3D platformers. 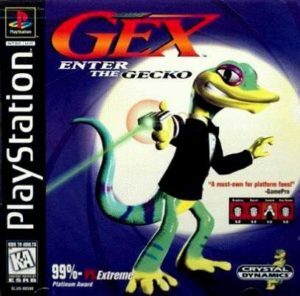 Gex: Enter the Gecko follows directly from the previous game, where our main character Gex has become famous for defeating the series antagonist Rez. After his newfound fame dried up, he spends all his time watching TV, and so when Rez is revived and begins to take over the ‘media dimension’ (basically a word comprised of various TV shows) Gex is tasked by the government to go in after Rez and defeat him once again. The game is a pretty solid platformer all around, despite a few niggles. You get around the stages by running and jumping as you do in pretty much every platformer, but you have a few gecko style moves to help you get by. You get a tongue attack which is mainly to eat bugs for health and power-ups, and you also have some basic combat moves like a flying karate kick and a tail whip, as well as using your tail like a spring to bounce around. 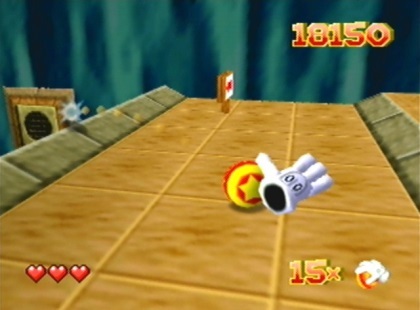 The levels work in a similar way to Super Mario 64 in that you select a specific mission in each level before you start it, then you work towards that objective once the level begins. 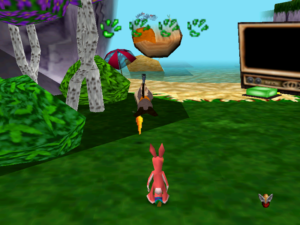 In each level there are 3 different groups of collectables, usually themed around what each level is based around (cartoons, horror movies, etc.). Once you’ve collected enough of the first group, all remaining collectables will turn into the second group, and the same goes for the second turning into the third, meaning there is usually a high number available for collection in each stage. Once you complete a mission in a level, you get a remote control; and once you’ve collected enough of these you, unlock boss stages and gates that lead to new areas and bonus stages. Once you’ve collected a lot of remotes, you unlock the final area and eventually fight Rez himself. Visually, the game looks pretty much as you’d expect a PS1 platformer about a bright green gecko to look: colourful and a little blocky. 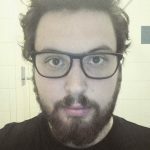 The different areas are easily identifiable by the different styles they employ, and it really helps to give each different type of level its own identity. Everything also fits the style of TV it’s trying to mimic. The kung-fu levels feel like old martial arts movies, and the horror movie channels look like a kid’s interpretation of a horror film. The music and sounds are mostly fine but unnoticeable, that is excluding Gex himself. 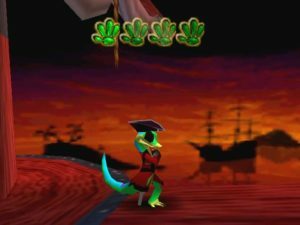 The voiceover for Gex is great, and he manages to have some genuinely funny one liners. An interesting point is that if you play the US version you have one voice actor, and if you play the EU/UK version you have a completely different voice actor. Both of these voice actors have done a pretty amazing job with the character, but the British accented version just completely suits the character and the storyline of being a government agent. Overall: A great little game starring a genuinely interesting character who will probably end up being one of your favourites. There are some annoying moments and bugs, but for the most part it’s entirely solid and is worth getting into. This is going to be difficult to discuss because the gameplay hasn’t moved on much from the previous game, other than some slight changes to the level of polish. 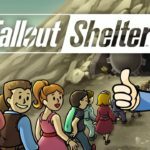 If anything, the storyline is the most interesting thing in that the story is complete crap and was obviously just there to frame the game. Obviously, that’s fine because it’s a game, not a movie, but considering that the last game managed to be entertaining at least during its cutscenes, it just seems like they gave up. The story follows Gex who uses the money he gained from the last game to start his own secret agent company. One day he gets a call from a female secret agent (who is displaying waaaaay too much cleavage) who says she’s been kidnapped. So, you go out to save her from Rez (who shows up for no reason) and once again save the world. The gameplay is pretty much the same with a few new niches mainly in the department of collectables. As in the previous games, you got the mini collectables and the remotes as your main things to get, but you also have power-ups to increase health, tokens to unlock bonus rooms, and even special challenges that would unlock cheat codes for you to use throughout the game. The lengths you have to go to for these cheat codes is pretty massive, but the way they are weaved throughout the gameplay is actually pretty cleaver. Mostly, the only thing you have to do to get all of the collectables is make sure that you carefully explore all of the levels and keep an eye out for secret passages. The biggest disappointment is the fact that the bosses are terrible. The first two are boring as all hell, and only the final boss really presents any variety or challenge. It’s almost not worth them being in the game at all. Graphically, the game is very similar to the second one, but there’s a lot more variety to the different environments. In the last game there were a few different level types with the same theming but different level design, however, in this game the levels tend to be single trips into individual styles of environments. This effectively means that there are lots and lots of different types of levels this time around instead of just a few archetypes, which is nice even if there are a few less levels than in the last game. The music is pretty stunning and is some of the best music available for games on the PS1, but having said that the voice acting lets the sound down. It’s nothing to do with the voice actors, as the American voice actor is the same as in the previous game anyway, but in the UK we ended up with Danny John-Jules who is a great and funny actor, but not even he could stop this script from ruining it for everyone. The writing seems to have been stolen from ‘the room’ and the puns are some of the worst I’ve ever heard in my life, even after a protracted camping weekend with my dad. Overall: Another pretty solid game from the same studio with slightly more polish. There’s not really much to choose between the two games, so if you’re looking for better level design go with this game, or for better voice acting choose the previous game. Why was this made? 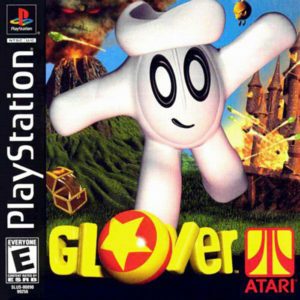 No, seriously I understand that this generation was the Wild West for the games industry, and things were just a bit insane at this point, but seriously, why does this game exist? You play a glove….A GLOVE!!! The story of the game…actually I have no idea what the story of the game is. It’s something to do with gloves and balls, but for the life of me I cannot figure out what is supposed to be happening. 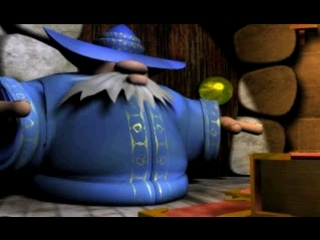 The main point seems to be to bring balls to a statue of a wizard so that he can zap them and open up a new area with a new ball in it, but what that’s supposed to achieve I don’t suppose I’ll ever know as I didn’t finish the game. The gameplay mainly consists of running around the levels (if you’re a glove, does it count as running?) and collecting things while also steering a ball around to do different things. You have a spell that can change the ball into different types so you can use it for different things. You have a heavy bowling ball, good for attacking, a beach ball, good at getting across gaps easily, a small metal ball that sinks in water and is easier to move up steep slopes, and a brittle gem which I couldn’t figure out the point of other than breaking when it touches anything. The controls are fine for the time, they work fluidly enough, and when you’re not holding onto the ball you steer around quite satisfyingly. Most of the time, however, grabbing onto balls (no puns, please) is basically a death sentence as they try to steer you in horrible directions that lead to loss of life. There also doesn’t seem to be much variety to the gameplay, it all consists of exploring the levels and getting past obstacles so that you can flip a switch that leads to the exit, then go onto the next level and do it again. Rinse, repeat. 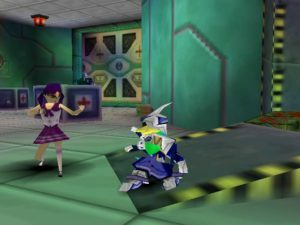 The graphics are appealingly bright and colourful, but the same can be said of pretty much all cartoon style games of the era, and unfortunately there’s not much besides the bright colours and whimsy to make the world stand out. It’s all very stock and has little to no personality put into it whatsoever. Then enemies just plain don’t stick in your mind after you stop playing and are all things like random sharks, dogs, or bugs, and just feel like they were designed by a committee. The music is actually pretty good and in places reminds me of Crash Bandicoot and Spyro, but it doesn’t make up for the state that the rest of the game appears to be in. 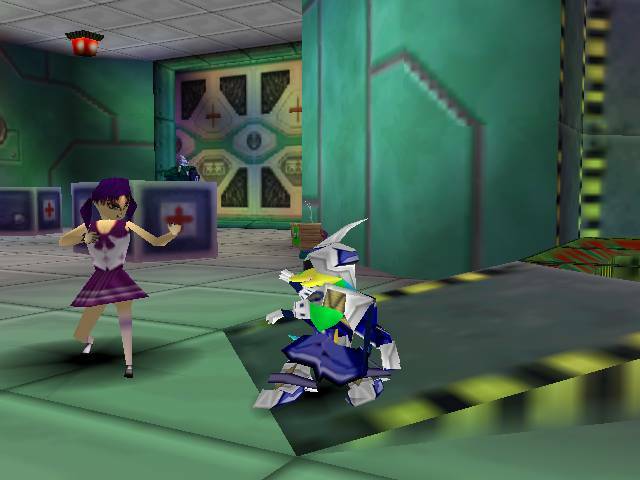 I’m not 100% sure that I haven’t been suffering from playing the apparently poorly done PSX port of the N64 game, because from what I’ve heard the N64 version is actually pretty decent, but since I have the PSOne version that’s the version I have been reviewing. Overall: An inferior version of a game whose entire appeal appears to be in its concept as opposed to the actual game itself. The music is interesting, but the graphics are sub-par. There’s not much else to say other than don’t play it unless you have a weird glove fetish.